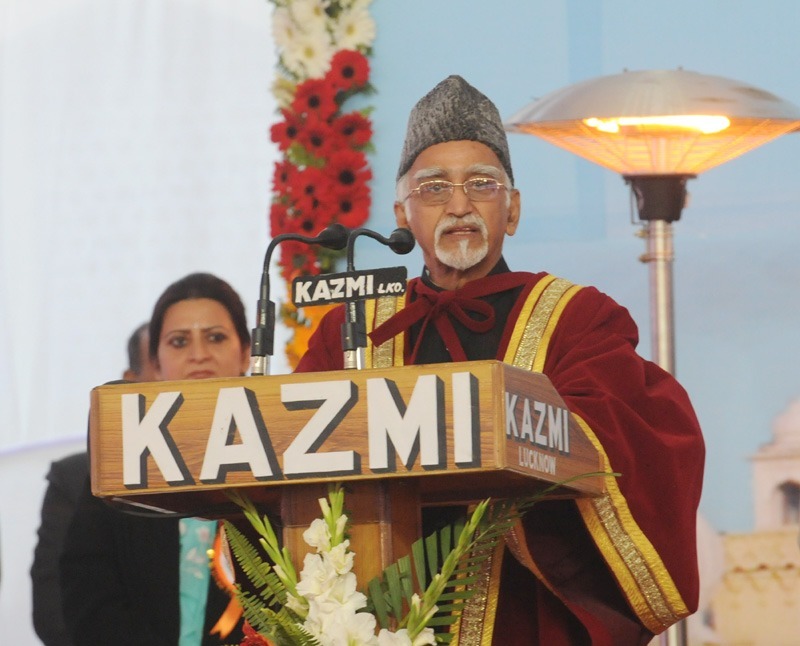 The Vice President of India M. Hamid Ansari has said that our system turns out nearly seven lakh science and engineering graduates every year. On the other hand, industry surveys show that only 25 percent of these are employable without further training. The picture is more dismal in other disciplines if a recent, non-official, employability report is to be believed. The conclusion is inescapable that the demographic dividend that is likely to last till 2040 may well be in danger of becoming a liability if comprehensive correctives on quality covering students, faculty and teaching, research and assessment standards are not forthcoming very quickly. Delivering Annual Convocation Address on 'The Challenge in Higher Education' at the University of Lucknow, at Lucknow, Uttar Pradesh today, he has said that it is thus evident that we confront multiple crises that relate to the input, the process, and the output. What is the purpose, and comprehension level, of those who enter institutions of higher education? Does the teaching process enhance these levels meaningfully? Does the outcome contribute to the requisite 21st century skills on the one hand and on the other to the research and innovation requirements? He said that any assessment of what ails our institutions of higher education must begin with the quality of the school leavers that seek admission in them. Since secondary education is the most critical segment of the educational chain dealing as it does with the youth who are the source of future social and human capital. The challenge here is to modulate the very considerable quality difference between the elite higher secondary schools in the public and private sectors on the one hand and the average or below average ones on the other, a difference that is often camouflaged by the variations in marking standards by different Boards. As a result, and in order to accommodate the less capable, undergraduate teaching often begins at sub-standard levels. Its impact is pervasive. The Vice President said that in the 21st century, the world is increasingly moving towards a knowledge economy, where industrial trade relations are being replaced by a complex system of information exchange. This has shifted the focus to a nation's abilities and resources to produce and generate new knowledge that can place it on top of the global power hierarchy. Countries are now required to match the global demand for skills with appropriate supply of human resources in order to remain competitive in the global market place. He expressed that a disturbing phenomenon is the lack of focus on research with only 1% of the enrolled students pursuing research in various areas. According to data for 2009, India stood eleventh in terms of number of papers published, seventeenth in terms of the number of citations, and thirty fourth in terms of number of citations per paper. Our research output as global share of scientific publications was a mere 3.5% compared to 21% of China. The total number of patent applications filed by Indians in 2010 comprised only 0.3% of the total applications filed globally. The picture is no better in social sciences and humanities. In social sciences, India is 12th in ranking with 1.18 percent of global publication share compared to China's 3rd rank and 5.14 percent share. The Vice President said that given the structure of our higher education system, the attainments of these objectives would need to be a collective effort of the Central and State Governments. The private sector has emerged as an important participant and its contribution in expansion programmes would need 'an enabling regulatory mechanism' for robust implementation, monitoring and quality assurance. This is yet to take shape. He said that the new Science, Technology and Innovation Policy announced by the Prime Minister in January 2013 stipulates a doubling of gross expenditure on R&D from 1 to 2% of GDP, increasing the number of R&D personnel by 66%, increasing India's share of global scientific publications from 3.5 to 7% and creating an environment for enhanced private sector participation in R&D.